The Equinox- the astrological New Year. Sun enters tropical Aries. Today, on March 20th , 2017, at 11.29 CED. the Sun will cross the intersection between the ecliptic and the celestial equator. Day and night are of equal length today and from now on, the Sun will be growing in light, as the days will become longer than the nights, until the summer solstice, from which day on the Sun will slowly be losing its strength. During the autumn equinox, day and night will have once again equal strength until the Winter solstice, the longest night of the year and the day when the cycle inverts starts once again. Since ancient times, the Sun’s Ingress in tropical Aries has been used in order to forecast the fate of the year to come. We can see, that the Sun is in the 10th whole sign house, in applying conjunction with Pars Fortuna, Venus and Mercury. The 10th house describes the government, authorities and public issues, which are highlighted in this ingress. Venus rules the 11th house of friends and alliances and the 4th of “homeland” or “fatherland”, or also properties. She is retrograde and in her detriment, heading back versus combustion. This describes corrupted alliances or partnerships which are going to be terminated or resigned. Properties might not increase in value as they did before and people might lose their homes. Mercury rules the 12th house of hidden matters, spy stories, refugees, and the 3rd house of communication, and contracts. He is peregrine and thus difficult and not trustworthy. He is going to oppose Jupiter in the 4th house. Jupiter generally rules abundance, in this chart, he rules the 9th house of foreigners. This seems to point to many refugees asking for asylum. The planet also rules the 6th house, linking the foreigners with the themes of the 6th house (illness). He is in mutual reception with Saturn in the 6th house, which describes long-lasting illnesses or quickly diffused ones. Jupiter is retrograde moving versus Mercury who rules permissions (3rd house) and all kind of unexpected problems (12th house). This situation is going to develop a huge conflict also due to Mercury’s exact opposition to Spirit (12° Libra). There is not really a bonification since the conjunction with such an afflicted Venus is not helping in any way and Jupiter is also retrograde but in his own terms and face. The AC is in Cancer, indicating that issues related to water and related resources will become important. The Moon is conjunct Saturn in the 6th house. Both planets are naturally cold, but here they are in a fire sign, pointing either to heated water, the lack of water or polluted water. This house is “inimical” to the AC, as is does not make any aspect to the AC. The house is linked to health issues, (employed) working places. If the ruler of the AC (of the Ingress chart) was in the sixth place, it will be infirmity. The Moon rules generally emotions, people’s feelings and generally how things are perceived by common people. In this case, the Moon is conjunct that planet which describes fear, losses, mistrust. This is stressful. In other words, people are afraid about health (-care), loosing their jobs and poverty. Also, the Moon is translating light from Saturn to the Sun (I do not consider sign boundaries here as the aspect is very close). This links jobs and health to the authorities and their decisions, but as Saturn is a malefic, these decisions might be wrong, raising social unhappiness. The ruler of the exaltation is Jupiter, angular in the 4th, in his own term and face but retrograde. The square to the AC in separative. None of these aspects is easy and all seem to challenge common people indicating rough times. If the Luminaries (or one of them) committed their own disposition to the Lord of the AC, it will not be necessary to look at another with this, because he himself is the Lord of the Year. In the 2017 Ingress, the Moon rules the Ascendant, but she is cadent and impeded by Saturn. Know that the luminaries, if they were in one of the angles, will be Lord of the year, unless the one which was in an angle was impeded. As we can see, in this chart, the Sun is angular in the 10th house, not impeded and thus to be considered the ruler of the Year (quartal). If the Sun is the Lord of the year, it shows the glory and majesty of the king. The Sun is exalted in Aries, which can also refer to “exited” or exaggerated kings or authorities. The rustics (common people) are described by the Lord of the Year and its place and from the aspect of the planets to him. But for the King […] you will judge from from the Lord of the Midheaven, and from the Sun and from the conjunction and the separation of the planets from them. And of the Sun and the Lord of the Midheaven, you will choose the stronger one. 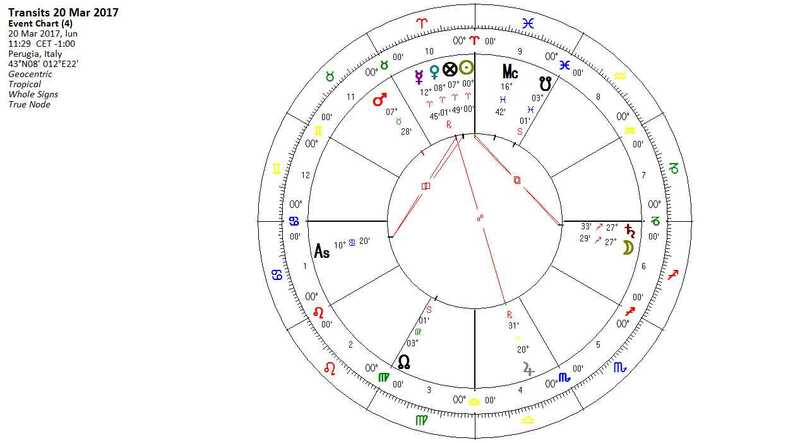 In this particular chart, it makes more sense to attribute the AC ruler Moon with the “rustics” and the exalted Sun with the government/authority. The next three months will be challenging and bring serious problems to work upon. 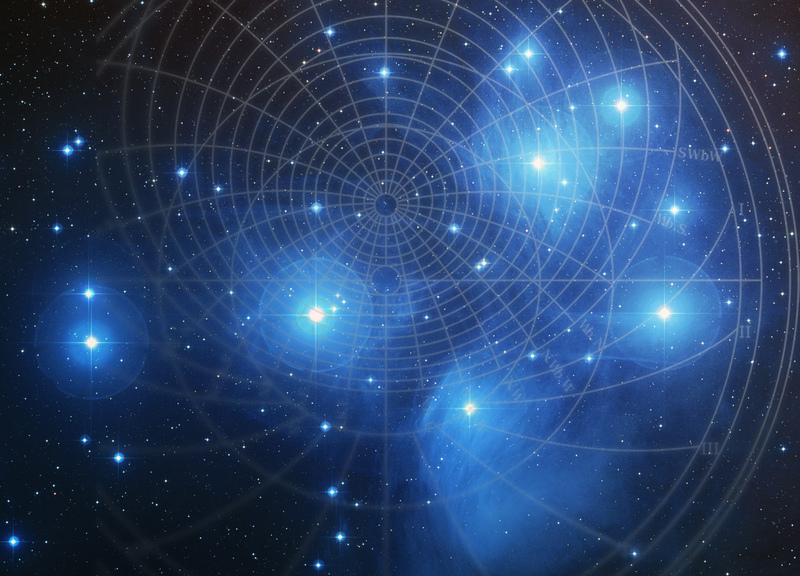 As the Moon/Saturn conjunction also occurs in conjunction with the galactic center, these challenges will set guidelines for the years to come. While I am writing this, the El Niño phenomena is devastating Northern Peru. El Niño Southern Oscillation refers to the cycle of warm and cold temperatures, as measured by sea surface temperature, of the tropical central and eastern Pacific Ocean. El Niño is accompanied by high air pressure in the western Pacific and low air pressure in the eastern Pacific. The cool phase of ENSO is called “La Niña”. The ENSO cycle, both El Niño and La Niña, cause global changes of both temperatures and rainfall. (wikipedia) But we could also consider the dramatic events of the Fukushima reactor, which is falling onto the ocean, heating the cold water up.